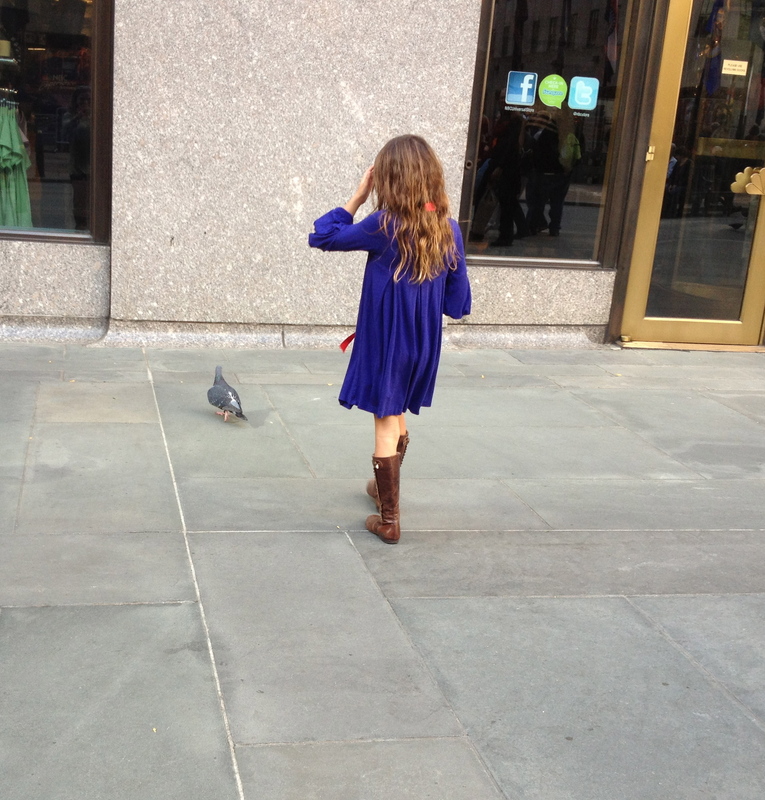 We had just walked into American Girl when my phone buzzed again. I’m dying to tell you about American Girl. I want to tell you about how Brooke insisted on staying despite the chaos or how she walked up to a little girl and (very loudly) said, “Hi, I’m Brooke, what’s your name?” and how both the girl and her mom kind of looked at each other and laughed uncomfortably but thank God answered and how Brooke walked away with her head held high and I was so proud and yet so heartbroken all at the same time. I want to tell you how Brooke declared that we were on a mission to buy purple pajamas for her American Girl, Nicholas – yes, she named her American Girl, who is every bit a girl, Nicholas – or how when I told her that she needed to ask someone for help, she walked up to a store clerk and said, “Can YOU help?” and when she said “Of course, honey, what do you need?” Brooke said, “To find them.” And when the lady asked, “To find what?” she said, “The purple ones.” and how I was so proud and yet so heartbroken at the same time. I want to tell you how she let out a pained cry when the store got to be too much but how she simply refused to leave until she had found those damn pajamas. And .. say it with me … how I was so proud and yet so heartbroken at the same time. But I won’t belabor the story any more than I already have because I know what you’re here for and well, poor April may not last another day. When I finally got to look at my phone over lunch, I was overjoyed. BOTH the director AND the producer had contacted Erin and promised their help. From Danny, the director. He’ll help you out when you get there. Have fun! i can certainly help. have them look for me in the back of the house in the piano corner of the house and i’ll make intros. they can also ask for me and the ushers should be able to point me out. For the first time in hours, I exhaled. Oh wonderful. We’ll find him as soon as we get there. Thank you again. There aren’t words big enough to tell you how much I appreciate all this. I swear I’m vibrating w excitement for my baby. I can’t believe this is an hour and a half away. After lunch, we headed toward the theater. But not without a couple of stops. 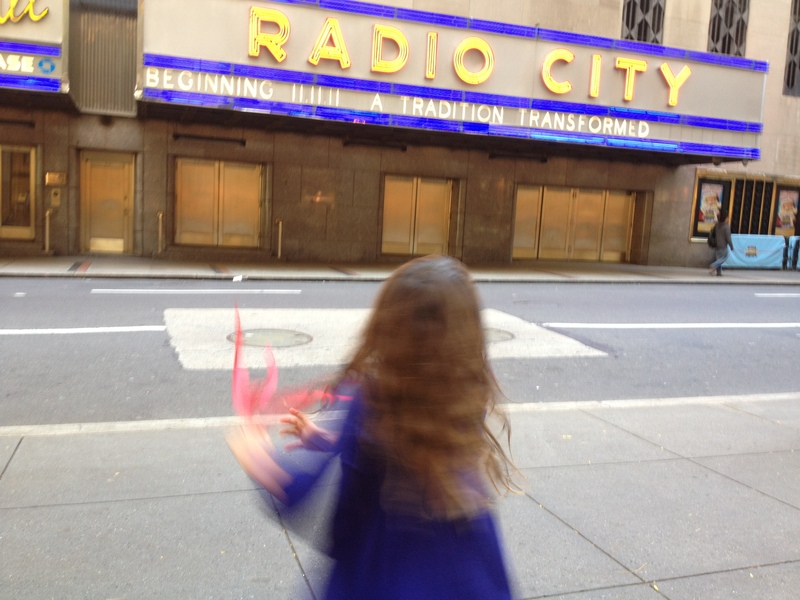 Like this one – spinning on the sidewalk in front of Radio City Music Hall ..
As we turned onto 50th Street, I could barely contain my excitement. “Do you see the sign, baby?” I asked, “Do you see it?” She had no interest in stopping for a picture. “I’m RRRRRREADY for the show!” she declared, pulling me toward the door. I snapped a shot as quickly as I could. The theater doors weren’t open yet, so we joined the crowd in the waiting area. I was on high alert, watching the environment, sniffing out triggers, searching my girl for signs of distress. There were none. 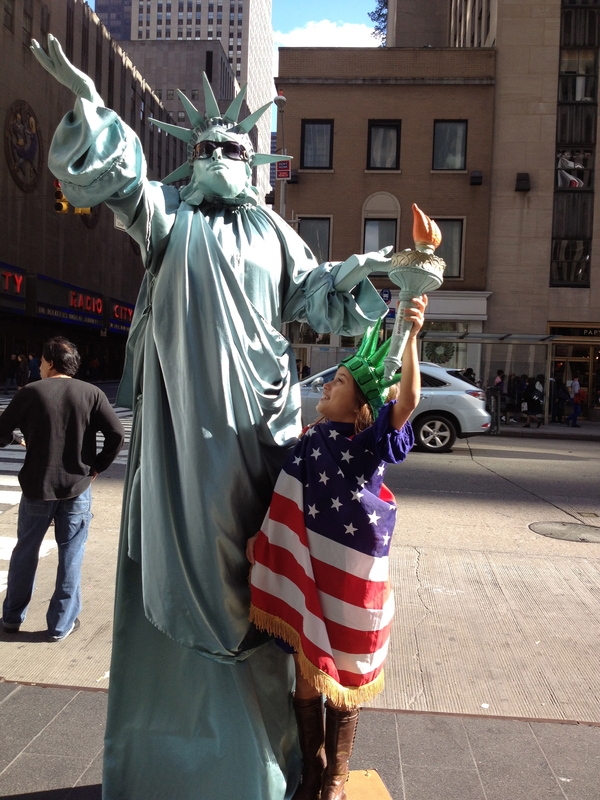 She was fidgety, of course, but once again her will dwarfed her challenges. I kissed her head and we waited. When the doors opened, we headed to the concession to pick up the gift we’d promised her big sister. As we waited on line, Brooke grew tense. “Oh no!” she said again and again, “We’re going to miss it. Oh no! Oh no! We’re going to miss it.” My assurances fell flat, along with the fact that people were still coming in in waves. Such details simply don’t register. We found our seats, then began to look around for what might be known as ‘the piano corner’. I was at a loss. We headed to an usher to ask for help. He was very sweet, but told me off the bat that it was his first day and he knew neither what a piano corner might be nor where to find the director. He sent us back up to the lobby to find someone else to help. As we headed back up the stairs, Brooke began to panic. “Oh no!” she now shouted again and again, “We’re going to miss it!” I did what I could to comfort her. “I promise we won’t miss it, Brooke. I promise.” But words were no longer penetrating the surface. A very nice lady tried to help us. She directed us back down to the theater and pointed to the piano corner. I followed her outstretched finger and, with Brooke in tow, began to step over a walkway attached to the stage. I tried to explain where we were headed. The usher pointed back up the stairs and told me that we needed to find the lady who .. ” I didn’t hear the rest of what he had to say. Honestly, it didn’t matter. Brooke was now yelling. “OH NO! OH NO! OH NO!” and there was not a chance in Hades that I was going to drag her back up the stairs. As calmly as I could, I interrupted the usher. I pointed to our seats, told him that’s where we’d be and settled in. Brooke was calm as soon as we sat down. 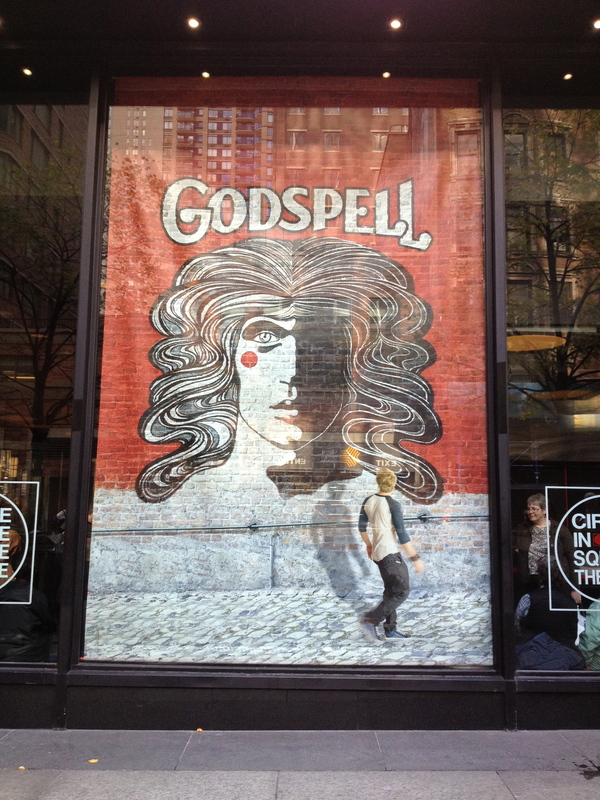 I asked her if she was doing OK.
“I’m RRRRREADY for Godspell!” she declared. And in that moment I knew, after all the prep and the scrambling and the failed attempts of years past, she really was. Ed note: I promise to tell the story of the show itself tomorrow. I also promise that I am not intentionally torturing you. I get up at 4:15 am, people. Like in the morning. Or sort of in the middle of what should still be the night. And I write until I run out of time before getting into the shower for work. So, with sincere apologies for the cliff hangers, unless you all want to start paying me to write, I gotta keep my job. See you tomorrow! Great! I am so ready for the show too and, hello, I am also so ready to pay you to write. 🙂 Have a great day Jess! I love how well you know your baby girl. Can’t wait for part three. I still know the ending (Sheila and April, no I’m not telling) but this is so exciting! I edited a soap opera magazine for 20 years and they never had cliffhangers like this! Love your story and can’t wait for the next installment. You would do well as a mystery suspense thriller writer. And I will pay you to write your diary just so you could sleep longer cuz any kind of waking up in the 4AM ish time should be illegal…… Can’t wait to hear the rest! This must be what it was like back in the day of serial stories in magazines. But hey, we only have to wait one day for each new chapter. If it was written any quicker we’d miss out on all the wonderful details! Thanks for taking us all with you. I don’t know how you manage to remember and recount so much. But having done so, it will be a treasure forever. I’m sure this could get this made into a bound book, the best souvenir ever! After our Disney trip almost a year ago now, I quickly (because otherwise it would never get done) had pictures printed and put them in a photo album. Forget all the knick-knacks, Andrew still loves looking at it and often picks the album to read at bedtime. I’m with you on the proud/heartbroken train. So proud when they do something that you know is hard for them, so heartbroken because it’s such an ordinary thing for anyone else. I honestly wondered how the heck you do it!!! I work full time also and i am in total awe of your time management skills and dedication ! looking forward to the rest of the story! Wheeee!!! Cannot wait to read the rest! The waiting is actually going to kill us but we know what we need to know (I think) – that somehow it all worked. Excited about that!! I read your post every morning. It gives me something to look forward to every day. You need to change names with “Drama Mama” because that is surely what you produce in your descriptions. You are the best in all you do..and you do know your babies. I truly wish that I could afford to pay you to write…it is clear that you are truly inspired to share your experiences with your daughter. Thank you very much. I love the details, and I LOVE LOVE LOVE the hanging story, but if I don’t hear the rest of it, I am driving over with some coffee, and having you sit down and TELL ME!!!!!!!!!!!!!!!!!!!!!!!!!!!!!!!!!!!!!!!!!!!!!!!! Oh, how I wish I could pay you to write! I just know you have books in you! Cliffhangers are killer but so worth it to hear the story. we’re RRREADY for more of the story! very, very good stuff, thx so much for posting this. I love, love, LOVE how assertive, and authoritative, and all-round kick-a** you are for your girl. You are adorable.